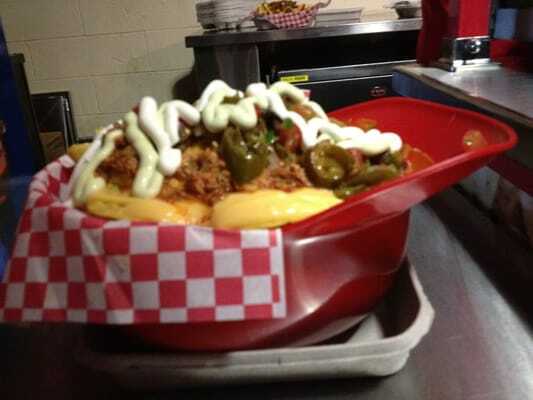 sixmanfootball.com • View topic - First or last Frito Pie of the season? First frito pie of the season. Or is it? A true corundum, is a six man football game played in July the last game of the season or the first game? Since these players were seniors possibly playing the last Sixman football game of their life it’s got to be the last game of the season. Unless you attend the 6-man Football Coaches all-star game later this month. Don Hardin bowl – Zephyr Texas, Bulldog stadium. Hot time tonight. It really was, temperature as we arrived in town an hour before game time, an even 100. Wish I could have remarked the town’s namesake, it wasn't meant to be. Zephyr, aka a gentle west wind, but what we had was a blast furnace minion, 100 degree blast out of the East, But on the plus side, the frito pie didn't get cold. Best frito pie for me this year. Not perfect but dang close. Chili was the meaty wolf brand variety and they didn’t skimp on it. The cheese was the pre softened nacho variety but it was plentiful, and hot. The fixings were do it yourself so I suppose you could have added lettuce and tomato but I choose not to. Had to break up the burger onion slices, and they were white onion not red. Fair size boat so the serving size was plenty filling and there was a slight amount of chili and chees coating the bottom after the feast. Overall, good food, good times, and a nice location. 1 to 100 score? High eighties, possibly near 90. Of course it’s hard to get in the 90’s, but it cn be reached. 1. The boat, big is better, this is a reward for standing in line missing some of the game. Plus nothing worse than still being hungry after it gone. 2. Chili, not hotdog sauce, meatier the better, homemade is usually awesome, and as we all know, chili has no beans. 3. Cheese, processed appears to be a evil necessity but get it heated up, it needs to be at the molten lava stage, providing shredded cheese will win you points but the chili has to be really hot in order to melt the cheese. 4. Onions, chopped dang it. Sliced onions are for the burgers, hot dogs and chili pie need chopped onions. Bermuda reds over whites and white over yellows. 5. Napkins, if you don't need multiple napkins, the pie isn't going to score high enough to matter. Taking a line from Don, good Frito pie on ya, see you zero week, support the local concession stand and support 6-man football programs everywhere. Re: First or last Frito Pie of the season? No sliced habaneros or scorpions? Sounds a bit like the helmet nachos at Angels stadium.